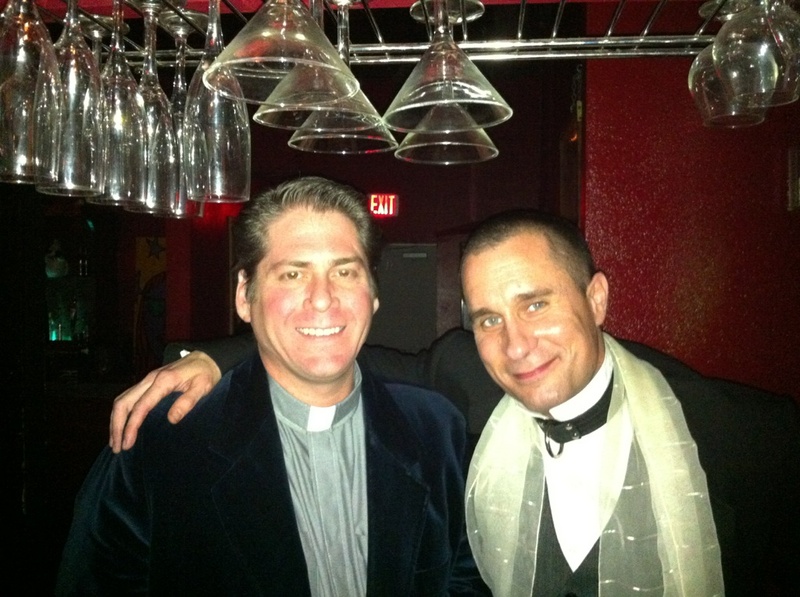 Christian Chiari -- Doctor of Divinity, Doctor of Philosophy and Universal Philosopher of Absolute Reality, Universal Life Church -- with Douglas Britt before he became Devon Britt-Darby. Photo: Ruben Reyes for Reliable Narratives. I drank like a fish at my bachelor party. Even tipping the strippers and flirting with the bartender couldn’t quiet my jitters. If you’ve ever married, you can probably relate, although my bachelor party was a tad unusual in that the moment it ended my wedding began. Held at Tony’s Corner Pocket, my favorite gay bar, one of its aims was to highlight the absurdity of Texas and U.S. marriage laws. It was an experiment in using the one marriage right American gay men universally share — to marry whichever women will say yes to us — as a weapon to get the marriage rights we don’t. Gay men have been marrying women since long before there was a word for “the love that dare not speak its name,” but in most cases we’ve done so in ways that reinforce inequality rather than fight it. Could art provide another way? The piece’s roots date to 2009, when — just as the debate over marriage equality was at another boiling point — the Houston conceptual duo of Michael Galbreth and Jack Massing known as The Art Guys staged a mock wedding to a live-oak sapling in the Museum of Fine Arts, Houston’s Lillie and Hugh Roy Cullen Sculpture Garden. Though I knew neither the artists nor Toby Kamps — then senior curator at the Contemporary Arts Museum Houston, which commissioned The Art Guys Marry a Plant — are homophobes, I found the piece breathtakingly tone-deaf. When I heard in September that The Menil Collection, where Kamps now works, had quietly planted the tree on its campus in March, accepted it into the collection in June and was planning a November dedication ceremony, the last thing I wanted was to reheat my 2009 criticisms with an added dash of vitriol. But nor was the solution that many of Galbreth and Massing’s detractors — and, ironically, perhaps the Menil itself — would have preferred: to deny The Art Guys the oxygen of publicity by ignoring the acquisition. My least favorite thing about the Houston art scene is its dearth of voices willing to speak honestly on the record about topics that need to be thrashed out. If we don’t care enough about our museums to fight over them, I repeat: Burn them down. That’s what I was at Tony’s Corner Pocket on Friday to find out. I had already been surprised many times over by what an emotional roller-coaster ride trying to find a bride had been. Between them, the first several women I asked had gotten feedback from boyfriends or fiances, attorneys, bosses, friends and even parents before sending their regrets. I didn’t get around to asking everyone on my list because, again to my surprise, each rejection — from women with whom I have zero romantic or sexual chemistry — hit me so hard it took a week or more to recover. I was wracked with self-doubt every step of the way. Yet every time I contemplated copping out — saying that accumulating rejections had been enough — someone reminded me why I was doing this. But he reminded me of the power of art just a few days out before my wedding, when Reese and I had found each other and were finalizing our decision on whether to go through with getting the marriage license, then the wedding. Even so, I got cold feet so many times last week it’s a wonder I didn’t catch hypothermia.